Very recently, in a very benign way, I got to live out this concept. I mean I live it all the time but this particular time was so obvious it begs to be shared, in my opinion. In Buddhism, attachment is called a source of suffering. And attachment can take many forms, imagine the suffering you see in yourself or others when encountering an unquestionable blind belief about something. Or the suffering you see in yourself or others when you or they are in the mind that some thing must always be that one thing; even if the situation says otherwise or calls for something different. (Attachment in this way is like a habit.) In another situation, attachment could be a desirous want, like the attachment in this story. At my friends’ birthday party, we had a white elephant gift swap. The rules were not that simple but we understood them: everyone picks a number and we pull mystery presents according to that number, each person could also steal another person’s present. I had number 12 of our 15; and when I picked a gift, lucky me (! 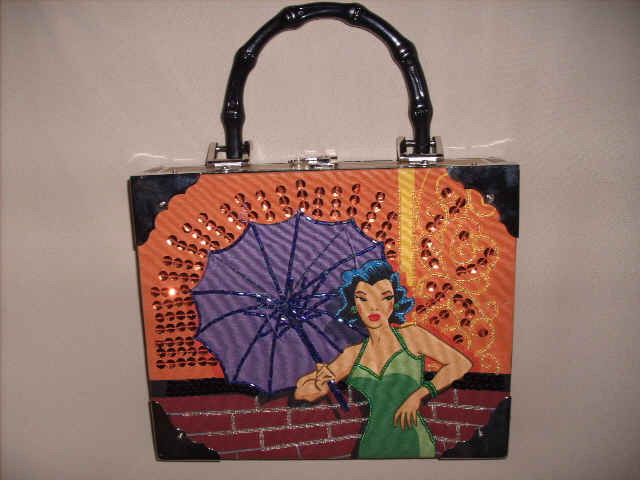 ), I got this beautiful cigar box that had been transformed into a beaded cigar box purse. It had a beautiful design on the outside and the inside was lined with faux leopard skin fur. If you’ve read Flowers and Weeds, you’ll most likely recognize that this is the flower. The purse is the flower because of its beauty and the desirous-nature it inspires, much like a flower’s beauty and essence is desirous. Everyone desires what it pretty to them. (If purses aren’t your thing substitute any other thing you would have liked.) And immediately, because I picked the present, this feeling of “I found it, it’s mine! Mine mine mine!” came over me. I became attached to this thing. With this said though, I knew this attachment was temporary in an immediate way, cuz the rules of the game say this object can be stolen at any time. The stealing part, if you haven’t figured it out, is the weed. People love the flowers but hate the weeds. Who wants to endure detaching from something they adore so dearly? And who wants to do it so quickly? I mean I just got the thing. This woeful weed of a feeling can be applied to more than a purse though: a friendship, an intimate relationship, money, a job, your mom, your dad, your confidence, all the things you identify as creating who you are as a person, these are the flowers that create your garden. These are the things you become attached to the most and are most threatened by the weeds of attachment. So here I am, waiting for the game to finish, hoping beyond hope that my present isn’t stolen but still trying to practice some non-attachment; basically realizing that things will happen, I may get to keep it or it may get taken and that is what it is. And in this way, attachment is okay. I would say that a benefit of this type of thinking is that if you know your relationships are impermanent, hopefully you would become more mindful and skillful in the behavior you employ within the relationship. If you know this person may not be with you after 24 hours, how would you act? Would you be more attentive and present with them? If you had 24 hours before something significant in your life changed, would you be more present with yourself? Chew on it. Just as I think I am getting away with my beautiful purse, it’s stolen*. Not even me putting out my best don’t touch this vibe worked. Realizing it is what it is, I pick another mystery present. (Those who get their presents stolen can pick another present.) And this time, I picked a box set of audio CDs featuring the popular Buddhist nun, Pema Chödrön. Like seriously? Of all the random things, what the hell? So there you go, flowers and weeds, white elephants and purses, attachment non-attachment. I look at the metrics of this site quite a bit so I have a suspicion that most people won’t click to read the article where this quote is from and that is not what I would like, especially in this case. So I am posting a bit more about this concept because it is really important to me that you at least read it. It’s important because the things I am about to highlight from the article are some of the basic core concepts that I believe in from the bottom of my heart. These concepts fuel my belief that all people in my life should be treated as a rose (within reason) and why I believe I must be treated like a rose in everyone’s life I am in (within reason). It is also why I believe it can be healthy for some people to practice multiple intimate relationships congruently or as appropriate to their life situation. Relationships aren’t just crutches that allow us to avoid … fears; they also provide conditions that enable us to develop our capacities so we can handle them [fears] in a more mature way. Relationships work to open us up to ourselves. But first we have to admit how much we don’t want that to happen, because that means opening ourselves to vulnerability. Now A Music Therapy Moment makes more sense, n’est ce pas?